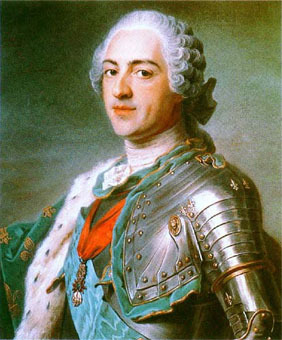 Louis XV, King of France, was the great-grandson of Louis XIV and the third son of Louis, duke of Burgundy, and Marie Adelaide, princess of Savoy. The first son had died in 1705, and in 1712 the second son, the duke of Brittany, as well as his father and mother, was carried off by a mysterious disease. Louis was thus unexpectedly brought into the line of the succession, and was only five years old when Louis XIV died. The dead king had endeavored by his will to control the administration even after his death by a carefully selected council of regency, in which the duke of Orleans should have only the nominal presidency; but with the help of the parlement of Paris the arrangement was at once set aside, and the duke was declared regent with full traditional powers. The duke had capacity, but his life was so licentious that what influence he had upon the king was for evil. Fleury, bishop of Fréjus, was appointed his tutor, and the little king was sincerely attached to him. The king attained his legal majority at the age of thirteen, shortly before the death of the duke of Orleans. His first minister was the incapable duke of Bourbon, who in 1725 procured the repudiation of the Spanish princess, to whom the king had been betrothed, and his marriage to Marie Leszczynska, daughter of the exiled king of Poland, then resident in Alsace. In 1726 the duke of Bourbon was displaced by the king's tutor, Bishop (afterwards Cardinal) Fleury, who exercised almost absolute power, for the king took little interest in affairs of state. His administration was successful and peaceful until the year 1734, when a disputed succession in Poland brought about the interference of France on behalf of the queen's father. France was unsuccessful in her immediate object, but at the peace of Vienna (1735) secured the possession of Lorraine. Up to this point the reign had been prosperous; but from this time on it is a record of declining national strength, which was not compensated by some days of military glory. Fleury's great age (he died still in office at the age of ninety) prevented him from really controlling the policy of France and of Europe. In 1740 the war of the Austrian Succession broke out and France drifted into it as an ally of Frederick of Prussia and the enemy of England, and of Maria Theresa of Austria. On Fleury's death in 1743 no one took his place, and the king professed to adopt the example of Louis XIV and to establish a personal autocracy. But he was not strong enough in will or intellect to give unity to the administration. The marquis d'Argenson writes that at the council table Louis "opened his mouth, said little and thought not at all", and again that "under the appearance of personal monarchy it was really anarchy that reigned." He had followed too in his domestic life the example of his predecessors. The queen for some time seems to have secured his affections, and she bore him seven children. But soon we hear of the royal mistresses. The first to acquire notoriety was the duchess of Châteauroux, the third sister of one family who held this position. She was at least in part the cause of the only moment of popularity which the king enjoyed. She urged him to take part personally in the war. France had just received a humiliating check at Dettingen, and the invasion of the northeastern frontier was feared. The king went to Metz in 1744, and his presence there did something to ward off the danger. While the nation felt genuine gratitude for his energy and its success, he was reported to have fallen dangerously ill. The king, of whom it was said that the fear of hell was the only part of religion which had any reality for him, now dismissed the duchess of Châteauroux and promised amendment. Prayers were offered everywhere for his recovery, and the country was swept by a delirium of loyal enthusiasm, which conferred on him the title of Louis le bien aimé. But his future life disappointed all these hopes. The duchess of Châteauroux died in the same year, but her place was taken in 1745 by Madame de Pompadour. This woman had philanthropic impulses and some real interest in art and letters; but her influence on public affairs was a fatal one. She had many rivals during her lifetime and on her death in 1764 she was succeeded by Madame du Barry. But the mention of these three women gives no idea of the degradation of the king's life. There has doubtless been exaggeration as to certain details, and the story of his seraglio at the Parc aux cerfs is largely apocryphal. But it would be difficult to mention the name of any European king whose private life shows such a record of vulgar vice unredeemed by higher aims of any kind. He was not without ambition, but without sufficient tenacity of purpose to come near to realizing it. To the last he maintained the pretence of personal rule, but the machinery of government fell out of gear, and the disorder of the finances was never remedied before the revolution of 1789. The peace of Aix-la-Chapelle (1748), which ended the war of the Austrian Succession, brought no gains to France in spite of her victories at Fontenoy and Raucoux; and the king was blamed for the diplomatic failure. The interval between this war and the Seven Years' War (1756) saw that great reversal of alliances which is sometimes called the "Diplomatic Revolution"; whereby France repudiated the alliance of Frederick the Great and joined hands with her old enemy Austria. The intrigues of Madame de Pompadour played in this change an important though not a decisive part. It was the cause of immense disasters to France; for after a promising beginning, both by land and sea, France suffered reverses which lost her both India and Canada and deprived her of the leading position which she had so long held in Europe. Her humiliation was declared by the peace of Paris (1763). There arose during the last years of Louis XV's reign a strong reaction against the monarchy and its methods. Military success had given it its strength; and its prestige was ruined by military failure. In the parlements, provincial and Parisian; in religion and in literature, a note of opposition is struck which was never to die until the monarchy was overthrown. France annexed Corsica in 1768, but this was felt to be the work of the minister Chauvelin, and reflected no credit on the king. He died in 1774 of smallpox. If the reign of his predecessor shows us almost the ideal of personal monarchy we may see in that of Louis XV all the vices and errors exemplified which lie in wait for absolute hereditary rule which has survived the period of its usefulness.